don't i? i do. (don't i?). 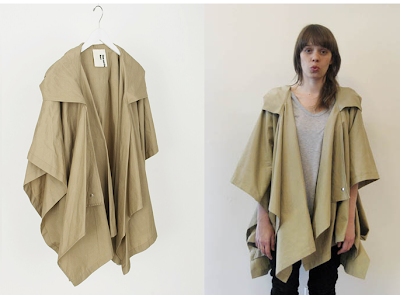 DRAPEY AVANT PONCHO (avancho?) !!! be mine? you may find this hard to BELIEVE, but i have not been so awesome about "living on a budget". shocker of the century, i know. my god that is fantastic. Please buy this. I will live vicarously through you. i've been wearing my acne raincoat NON STOP since i'ts been raining all over the place in ny. get it. it'll make you happy. Ohhhhhh, me likes. Get it! I bought that poncho because it has an "Unbreakable" secret superhero vibe to it. i live in hawaii and def don't need a drapey rain jacket. but this is SO good. i lovee that jacket/poncho. pure amazing.